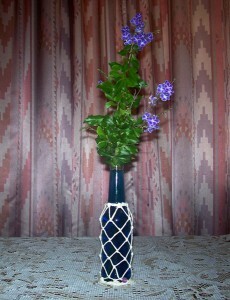 The first of our craft ideas was to make a vase out of a bottle. 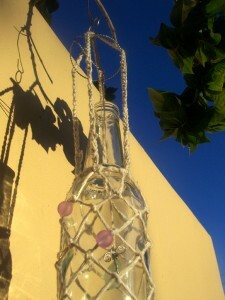 Tony did an excellent job of creating a macrame net effect around the bottle. 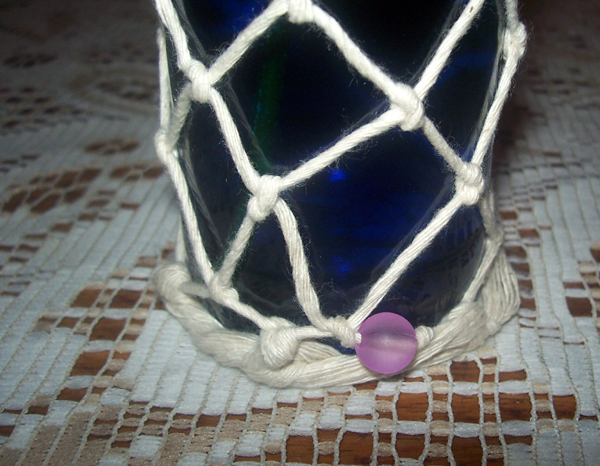 It was my idea to add a bead, but I was almost too late when I thought of it, so the bead has ended up right at the bottom of the bottle (or vase) and it was my idea to add food colouring to the water – the dark or coloured water makes the netting around the bottle stand out nicely, and the bead stands out better too. We only had three colours of food colouring to choose from to dye the water in the vase: yellow, pink, and blue. The yellow just seemed like an awful idea, and we thought the pink would look too much like the bead, but being a different sort of pink, we almost chose it, but then settled on blue food colouring. It was just one tiny drop of blue food colouring that turned the water quite blue. It was actually fascinating watching the food colouring swirl down slowly into the bottle of water, perhaps something worth catching on video sometime, or photographing against a source of light. 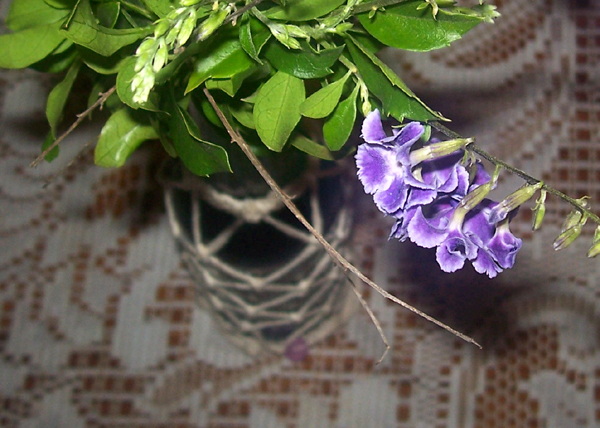 My mom loves plants and flowers, and we gave the bottle (or vase) to her, to put on the centre of her dining room table. 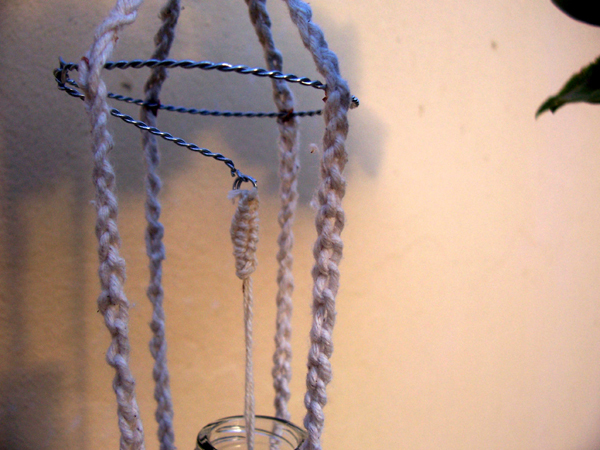 Up next for our creative crafts day was a wind chime, also made from a bottle with a macrame net effect around the bottle. This time I remembered to remind Tony early on that I wanted to see a bead in the net around the bottle, and while I was thinking of it, asked him to actually add three beads, and not just one. 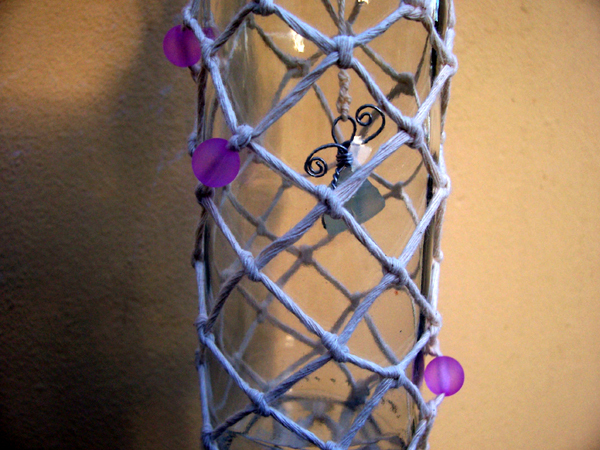 Tony is good at crafts and macrame, and making the bottle windchime was his job and his work entirely. 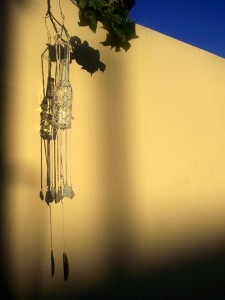 For me, for the bottle windchime, it was just giving ideas again – I wanted to see a piece of sea glass dangling inside the bottle, and I wanted to see some sea glass pieces hanging below the bottle with a central piece of sea glass between them. It was Tony’s job to work out how to present to me what I wanted to see, and what a great job he did. 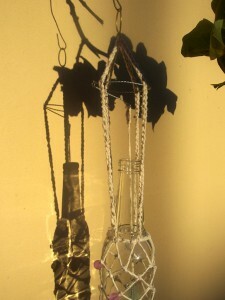 I think his bottle and sea glass windchime is absolutely gorgeous! 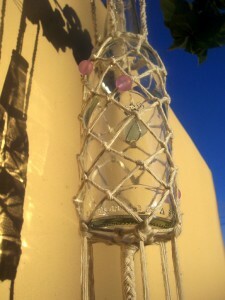 I also love the 4 braided threads extending above the top of the bottle, and the wire work from which the piece of sea glass on the inside of the bottle hangs. 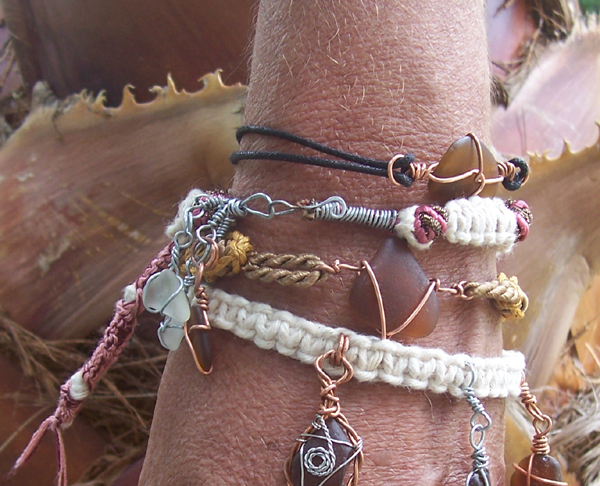 We’ve added a piece of bamboo at the very bottom, but we’ll be changing this to rather be a piece of sea glass too. 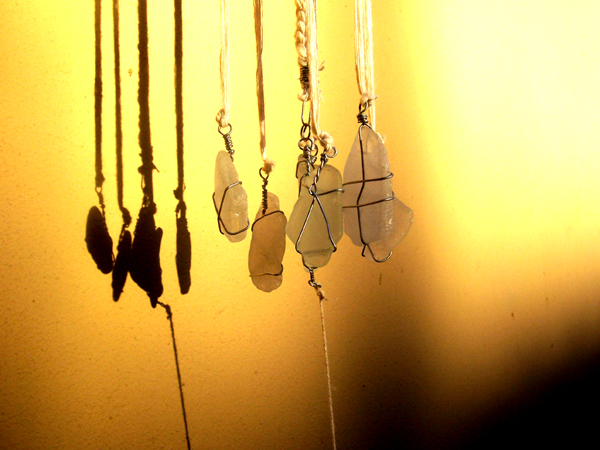 After giving Tony my ideas of what I wanted to see in the wind chime, and after helping him select the pieces of sea glass that were to hang from it, I left him to it, while I started on my rag rug. 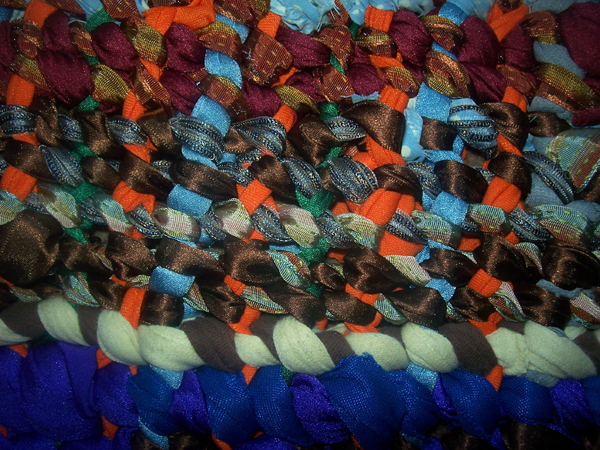 My fingers and shoulders are still a little stiff today – yes, the rag rug was made by me! I struggle to fiddle with little things like intricate wire and thread work, so I leave that to Tony, but making a rag rug was my mission yesterday, and I succeeded. I’ve wanted to make a rag rug for many years, and although I see much room for improvement, I’m pretty pleased and proud of my first rag rug making effort. It did take me a while, though – a bit more than 10 hours. 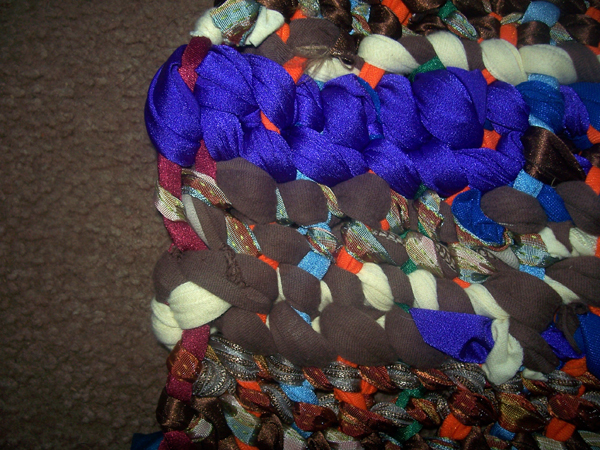 I can cut down that time by having strips of material ready ahead of time, and by having a better loom to weave on. 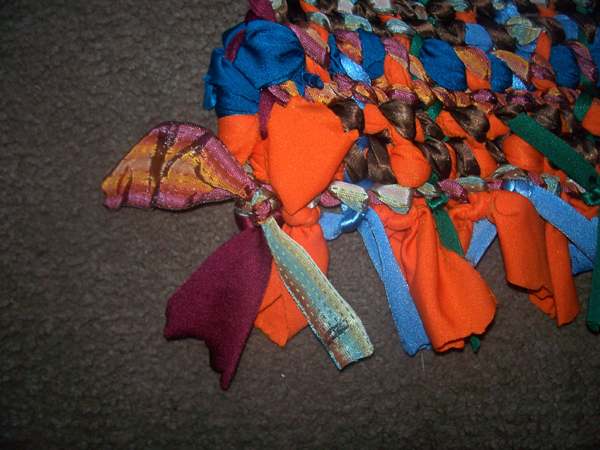 I could also simply weave in and out of my warp, instead of weaving using the technique I did – but I saw a handmade rag rug making video tutorial with a lady using a specific weaving or rag rug making technique, and I wanted to use the same technique. I watched a part of that video a good few times before I understood how simple it was to weave the weft through the warp – I’d been over complicating things in my mind, thinking there was more to the technique, but it’s basically just a twist, sort of. I also didn’t have two metal rods to help keep the sides straight and from scrunching inward while I worked, but luckily Tony came up with the idea to make ties every few cm down the sides, and that kept my sides relatively straight, and prevented my work (or the warp threads running from top to bottom) from scrunching up towards the centre. 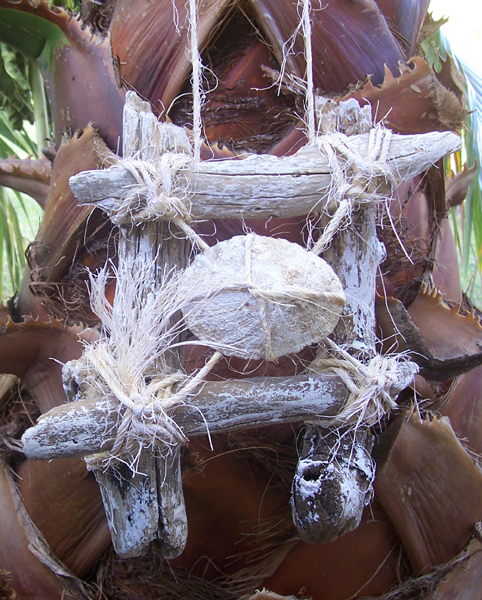 The frame or weaving loom I was using was handmade by Tony, using broom handles, and doesn’t have nails or wooden pins at the top and bottom, so I tied each thread of my warp. I do realise now that I could have just looped my warp thread over the top and bottom broom stick handles instead, but what I really want is a loom with nails, so that I can just lift the finished work off at the end, without having to tie knots at the top and bottom end. 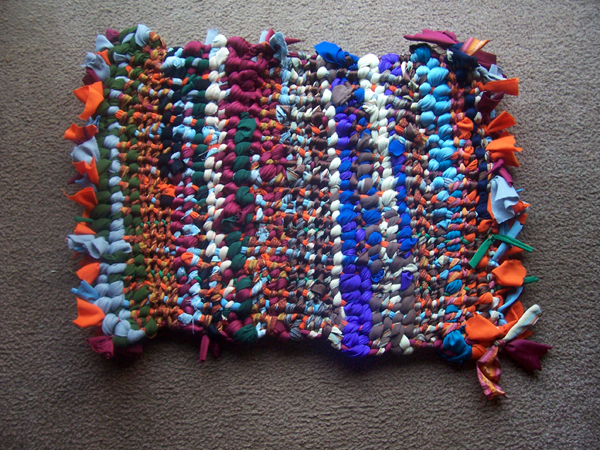 I don’t really mind the tufts or little strips at the top end and bottom end of the rug, but I’d also like to make some rag rugs with no tufts at those two ends at all. I’m hoping to decrease the amount of time it takes me to weave a rag rug quite considerably next time, if we come up with a better homemade loom. I can also use thicker strips of material, so it doesn’t take too long to get finished. At times it felt like my rug wasn’t getting any longer at all, but I was determined to carry on and get it all done in one day. Well, my rag rug feels wonderful beneath bare feet, and it was great for both of us to take turns standing on it at the end of our creative crafts day yesterday, barefoot, just before bed.